A couple camping in the remote woods of Bluff Creek, California discovers that the legend of Bigfoot may be real. Jim Kessel and his girlfriend Kelly Monteleone take California’s Route 96, also known as “The Bigfoot Byway,” to Trinity National Park in Bluff Creek where Jim plans to record a documentary about Bigfoot. After interviewing locals, Jim and Kelly plan to camp at the original site where Roger Patterson and Bob Gimlin filmed their infamous Bigfoot footage in 1967. After eating Bigfoot Burgers at the Early Bird Café, Jim interviews skeptic Nita Rowley at the Willow Creek Visitors Center. Steve Streufert of Bigfoot Books provides information on the PGF film site. Tom Yamarone sings a song dedicated to Patterson and Gimlin. Shaun L. White Guy, Sr., a resident of the nearby Hupa Indian Reservation, tells the tale of her childhood Bigfoot encounter. Former ranger Troy Andrews relates a story about his dog being killed by something unknown. Jim and Kelly drive to the main pathway leading to the PGF film site, but they are turned away by an angry local who threatens the couple not to enter. Jim takes a different route into the forest instead. After pitching their tent, Jim and Kelly go swimming in a nearby creek. When they return to their campsite, they discover that their tent has been overturned and their belongings have been scattered all around the trees. Jim proposes to Kelly, but she convinces Jim that they should move in together first. During the night, Jim and Kelly are awoken by strange noises outside their tent and in the distance. Rocks are thrown against their tent and something comes close enough to frighten them both into a panic. Jim and Kelly decide to leave in the morning, but become lost in the woods after Jim retrieves an odd patch of hair found on a tree stump. They find footprints near a creek bed before being chased by something unseen. That night, they stumble upon a naked woman in the woods before being attacked from the shadows. Kelly can be heard screaming as Jim and his camera are pulled away while being mauled off-camera. The work of filmmaker/comedian Bobcat Goldthwait has been and can be classified many different ways, but “cutting edge” does not fit a descriptor. While “God Bless America” was bitingly funny as subversive comedy, a satire lampooning obsessions with reality television stardom can hardly be considered timely when released in 2012. “American Idol,” that film’s chief target, hit its ratings peak six years earlier in 2006, after all. Even dated material can still pack a punch, although it has a challenge connecting to the jaw if too much time has passed in the meanwhile. Yet coupled with an appreciation for Goldthwait’s continued development as a competent director, excited chatter buzzing about the festival circuit gave reason to be optimistic that “Willow Creek” had something inventive, frightening, and entertaining in store. Let me declare in very simple terms, “Willow Creek” is none of these things. I am legitimately stunned that so many positive reviews exist for “Willow Creek.” Not because it is impossible for someone to enjoy the movie, or because the film does not deserve published praise it may have earned from those who did enjoy it. It is just that nigh daily, I read scathing criticisms bemoaning “found footage” films simply for being “another formulaic found footage film,” which is precisely what “Willow Creek” is. For the life of me, I cannot think of anything that justifies categorizing it as an exception to that generalized disdain for the much-maligned format. Assuming everyone else did in fact see the same sleeping pill supplement I witnessed, the best conclusion I can draw as to why my negative reaction is vastly different than the seemingly popular opinion of positivity is that I saw the film alone at home. Others have spoken of tension-filled theaters and an electrified atmosphere heightened by those sitting around them. Perhaps seeing the movie with an audience gives “Willow Creek” a different impact. I suppose if you have that option, then take it. Because brushing my teeth afterward provided more excitement than the personal home video screening of “Willow Creek” did. Jim is a Bigfoot enthusiast who sets out for Bluff Creek, the California site where Roger Patterson and Bob Gimlin filmed their own infamous “found footage” back in 1967. With one side of her mouth smirking, and the other side sighing, Jim’s girlfriend Kelly joins him for the outdoor adventure partly to be supportive and partly as a “why not?” lark. Armed with a camera and a microphone, Jim bounds about neighboring points of interest interviewing folksy locals about the elusive cryptid for an amateur documentary intended to play who knows where. If that sounds like act one of virtually every “found footage” movie you’ve ever seen, that’s because it is. But “Willow Creek” seems to forget that a slow burn introduction should ultimately lead to something, and so it ends up with a second and a third act that are just as dull as the first. In other words, “Willow Creek” takes the most despised element of any “found footage” movie and makes an entire feature film out of pointless non-events. 0:00:00-0:30:00 – Interviews with area residents and trips to nearby cafes, motels, and assorted Bigfoot statues for local color. Yes, that is an entire half hour of average persons recalling Sasquatch sightings, musicians singing homemade songs about Patterson and Gimlin, and Jim and Kelly eating Bigfoot Burgers at a greasy spoon. 0:30:00-0:40:00 – Jim and Kelly finish their drive and hike the rest of the way to their campsite. Aside from a brief encounter with an angry mountain man issuing a trespassing threat, this is ten minutes of dirt paths, tree branches, and aimless travel. 0:40:00-0:47:00 – The tent is pitched, skinny-dipping ensues, and the first real hint of trouble comes when Jim and Kelly return to an upturned campsite. An awkward relationship moment between Jim and Kelly provides the film’s best scene, which is ironically unrelated to any physical horror at hand. At this point, it should be mentioned that the best thing about “Willow Creek” is actress Alexie Gilmore. Her character is a skeptic with rational cynicism about Bigfoot’s existence who argues with her boyfriend using logic and facts. Kelly comes across as a naturally “real” woman and Gilmore does not have to force an inherently likeable personality to take shape. 0:47:00-1:05:00 – Next, “Willow Creek” arrives at its much talked-about single take that is nearly twenty minutes of Jim and Kelly cowering in their tent. While not an entirely novel idea, it is a bold choice that makes for an interesting scene, although not the tensely terrifying one that others describe. Even if it made sense that a Sasquatch might randomly punch a tent wall from outside, run away, and then come back to do it again, this hasn’t been a fresh concept since “The Blair Witch Project” did it in 1999. 1:05:00-1:13:00 – Jim and Kelly become lost in the woods, just like everyone else who has ever been between trees in a “found footage” movie. When something visual finally does take place, the first thing the camera does is to go out of focus while pointing at the ground. 1:13:00-1:18:00 – For the first three of the final five minutes, the camera faces Jim and Kelly as they stare into the darkness waiting for the inevitable attack everyone knows is coming. The attack takes place, and the last two minutes center full frame on trampled grass as the couple is mauled offscreen. Honestly, awarding one out of four stars to a movie this dull and unsatisfying is generous, and the bulk of that lone star is earned almost solely because Alexie Gilmore is so enjoyable. 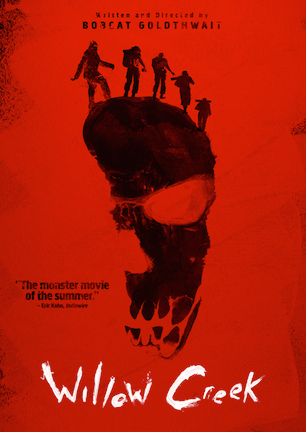 Of “Bigfoot: The Lost Coast Tapes” (review here), “Bigfoot County” (review here), and “Exists” (review here), “Willow Creek” ranks dead last among “found footage” Sasquatch-themed thrillers. “Willow Creek” is not poorly made, it is merely boring. The film feels more authentic than most “found footage,” but it is not scary and it is barely interesting as entertainment. The best thing that can be said about “Willow Creek” is that it accurately captures what a real-life Bigfoot hunt would probably be like: completely uneventful and ultimately a letdown. June 7, 2014 by Ian Sedensky.